Wireless Car Charger & Holder by ZALE is just the device you were looking for! 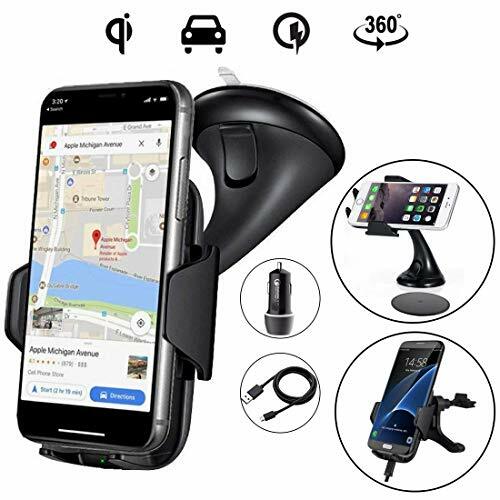 It combines two of the most important features needed to safely and efficiently use your phone in the car: hands free operation and wireless charging. Whether you’re using the GPS, trying to make a phone call or just listening to your favorite song while driving, you want to be able to do all of these without putting yourself and others in danger. This is when a car phone holder comes in handy. It keeps your device in an easily accessible spot from which you can operate it using only your fingertip, without distracting you from driving. But you also want to get to work or home with a fully charged phone. Charging via cable is really frustrating, especially in your car. It always keeps getting tangled around the shifter, cup holder, steering wheel, you name it! This is when you understand and appreciate the usefulness of wireless charging. So wait no more, get yours today! Note: Your phone may not charge at optimal efficiency if you are using a thick protective case. 【2-in-1 DESIGN】 Wireless charger and car phone mount combined as one. Forget about getting your charging cables tangled everywhere. 【COMPATIBLE WITH ALL WIRELESS CHARGING PHONES】 With the QC3.0 Car Charger Adapter included in the bundle, you can charge all phones that support Qi wireless charging: iPhone X, 8, 8 Plus | Samsung Galaxy S9 / S9+ S8 / S8+ S7 / S7 Edge, S6 / S6 Edge+ | Note 8 / 7 / 6 / 5 (Fast Charging), Nokia, Sony, Nexus, LG, Motorola. 【EASY AND SAFE TO USE】 Fully adjustable 360 ° flexible design for GPS navigation use. Unlike "gravitational design" chargers, you can use your phone in Landscape mode without it falling out of the cradle. Great grip so your phone sits safe and sound. If you have any questions about this product by ZALE, contact us by completing and submitting the form below. If you are looking for a specif part number, please include it with your message. Wireless Bluetooth FM Transmitter Radio Adapter Audio Receiver Stereo Car Kit With USB Fast Car Charger Hands Free Calling Phone Holder for iPhone,Android and MP3 etc.